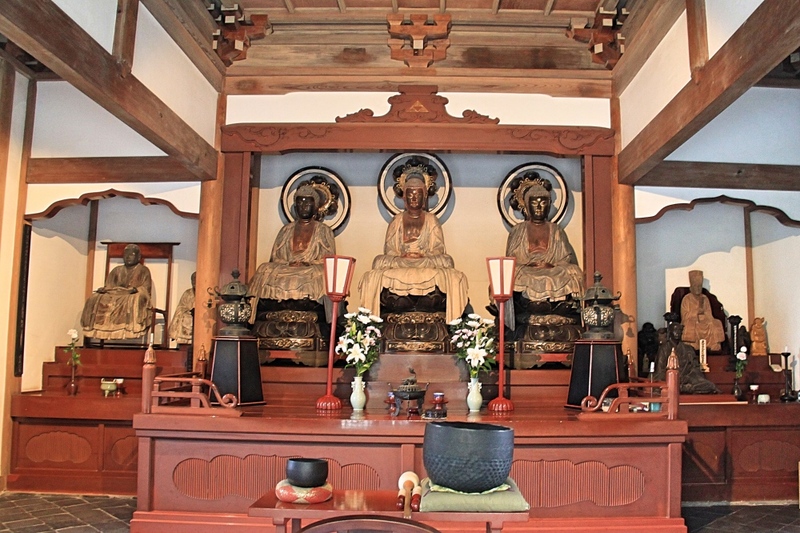 If you want to escape the crowds of Tokyo, another popular outing is a day trip to Kamakura. 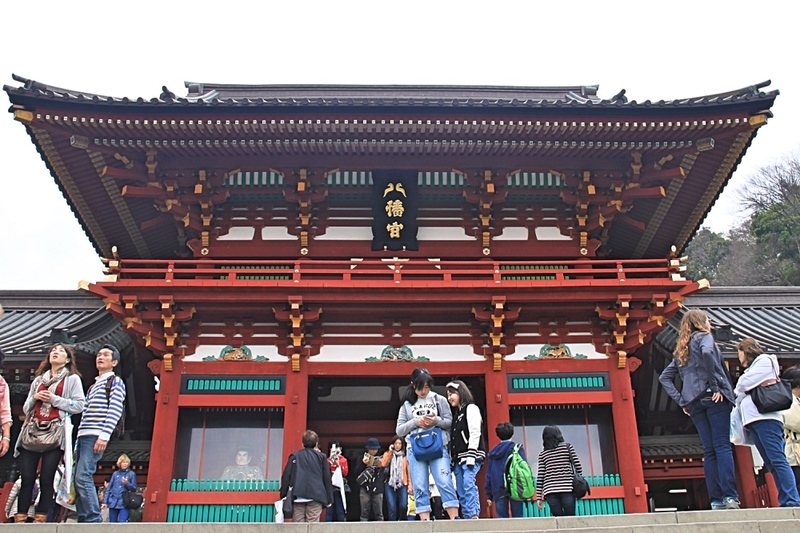 Kamakura has so many temples that it is also known as the Kyoto of East Japan. From Tokyo, it takes between one to one and a half hours by train to reach Kamakura, depending on which train line you use and your point of departure. We were staying in Shinjuku and simply hopped on the JR Shonan Shinjuku Line which took us about an hour and cost us ¥920 one way each. We alighted a stop early at the Kita-Kamakura station as we wanted to walk the Daibutsu Hiking trail. 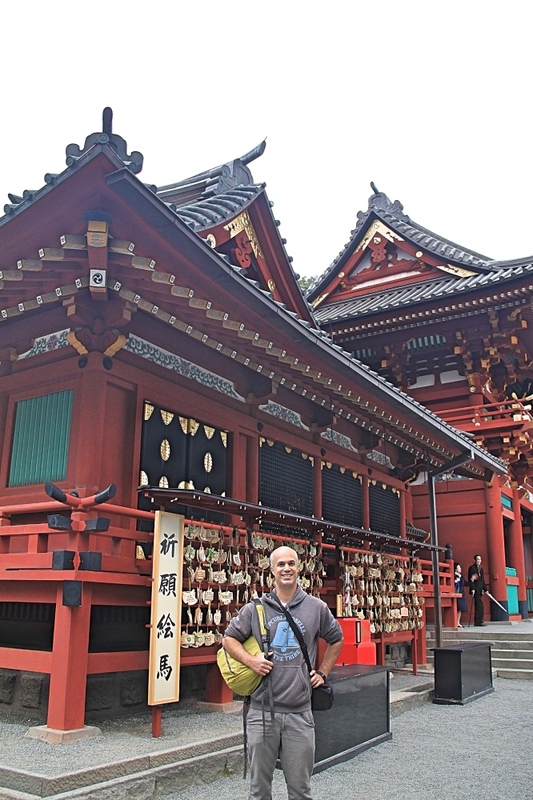 But before starting the hike, we visited the Engaku-ji and Jochi-ji temples which are next to the start of the trail. Engaku-ji is right near the Kita-Kamakura train station and is one of the leading zen temples of Japan. It is nestled on a lush forested hill and there is a slight climb before you reach the temple. The temple was very beautiful and serene. 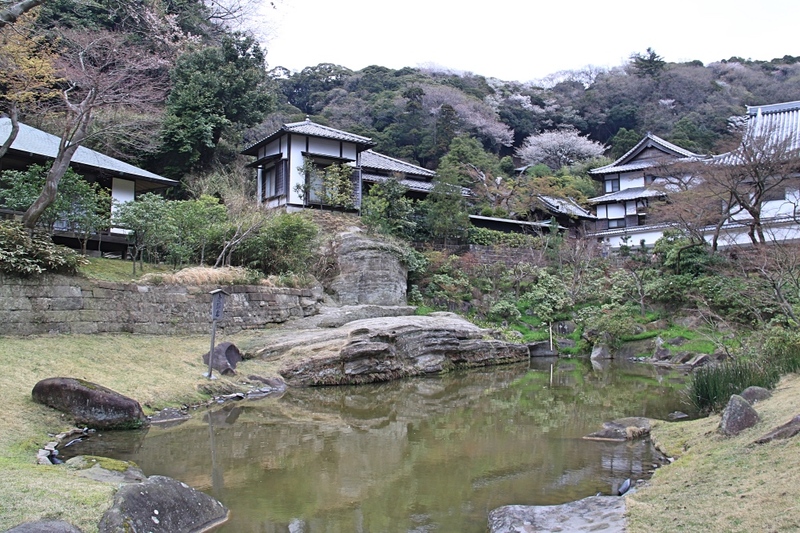 There are several buildings and gardens to explore as well as a traditional tea house. It’s a very nice place to start your trip. The entrance fee is ¥300 for adults. The main gate of Engaku-Ji. The main gate of Engaku-Ji surrounded by cherry blossoms. 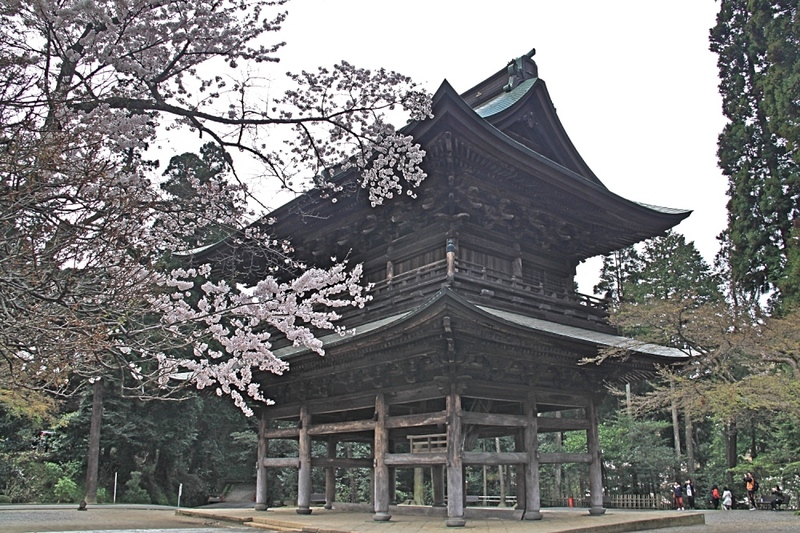 Jochi-ji temple is also in the forest, just a ten-minute walk from Kita-Kamakura station. It’s not a large temple, but it is beautiful and well-maintained with an interesting cemetery and some caves behind its main hall. Another Zen temple of Kamakura, Jochi-ji is relatively quiet compared to the other temples in the area. The entrance fee is ¥200 per adults. A tranquil pond behind Jochi-ji temple. 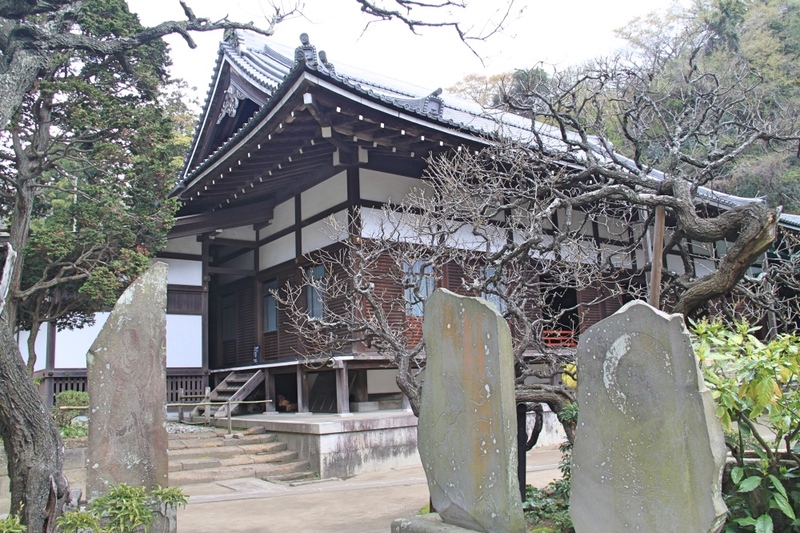 The Jochi-ji temple and its cemetery. Beginning from Jochi-ji, the Daibutsu hiking trail is a three-kilometre walk through the woods which after about an hour leads you to the Great Buddha Daibutsu. 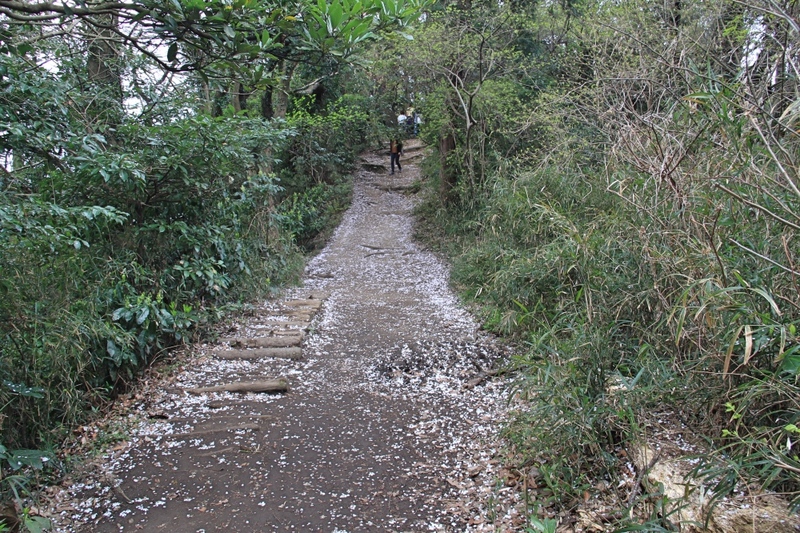 This trail is well marked and you can visit some interesting temples and shrines along the way, with some pleasant views over Kamakura’s countryside. 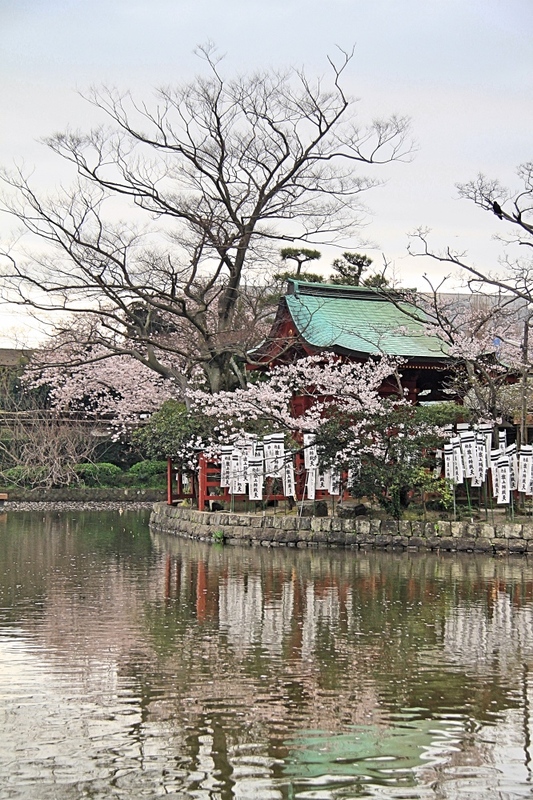 Half way through you can rest at Genji-yama Park, where in the right season you can admire the cherry blossoms in bloom. This 13.35m bronze statue of Buddha is the most visited attraction in Kamakura and it gets extremely crowded. 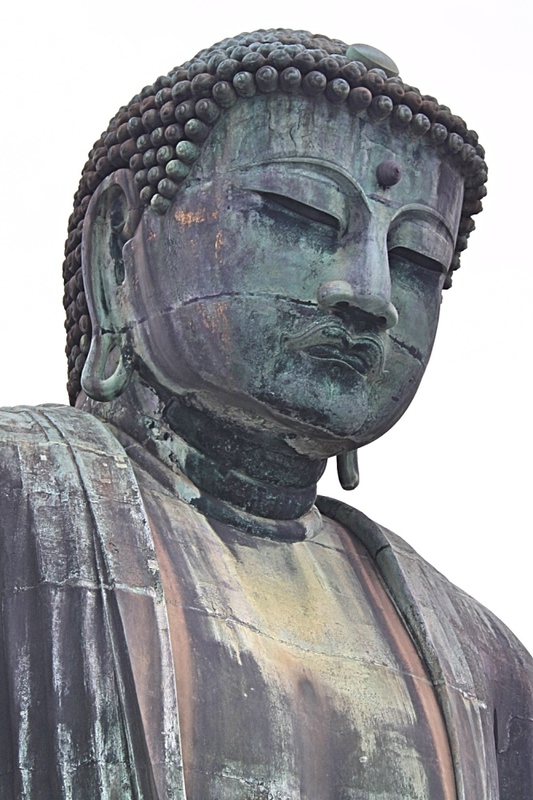 It is the second tallest bronze buddha in Japan after the one in Nara. To see it at its best, we would suggest visiting very early. Sadly by the time we reached Kamakura and finished the trail we arrived at the Buddha close to midday, along with a bunch of tour buses and the hordes of tourists they brought with them. Still, we enjoyed seeing the Buddha who looked very serene and calm despite all the commotion around him! A head shot of the big buddha. The big buddha with the remaining cherry blossoms. Even with the crowds this still felt like a peaceful place with its beautiful gardens and the sound of monks chanting in the background. The entrance fee is ¥200 per adult and you can pay an extra ¥20 to go inside the statue. 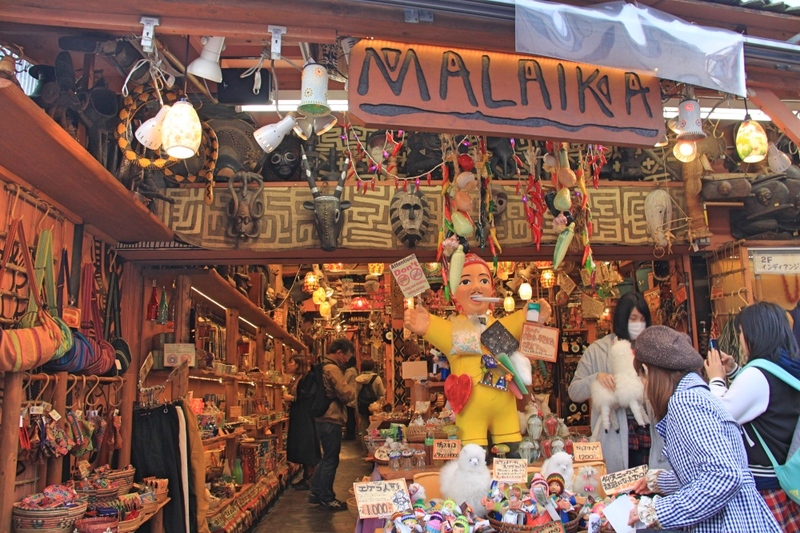 It’s definitely a must visit in Kamakura. 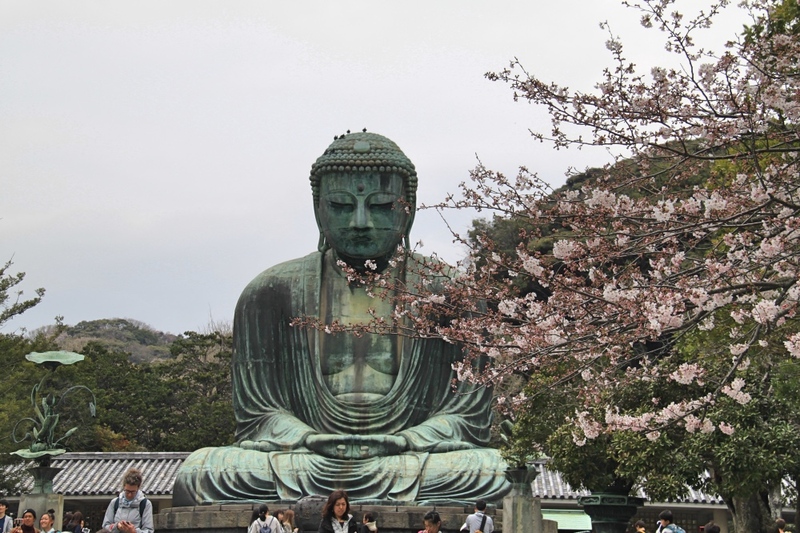 After visiting Daibutsu, we took the train from Hase station to the Kamakura town centre. Hase station is next to the Hase Dera temple. Sadly we had to give that temple a miss due to the pouring rain, and instead, we headed into town to grab lunch. In front of the train station is the main street of Kamakura, known as Komachi-dori Street. This long street heads north towards the Tsurugaoka Hachiman-gu temple and its surrounding gardens. 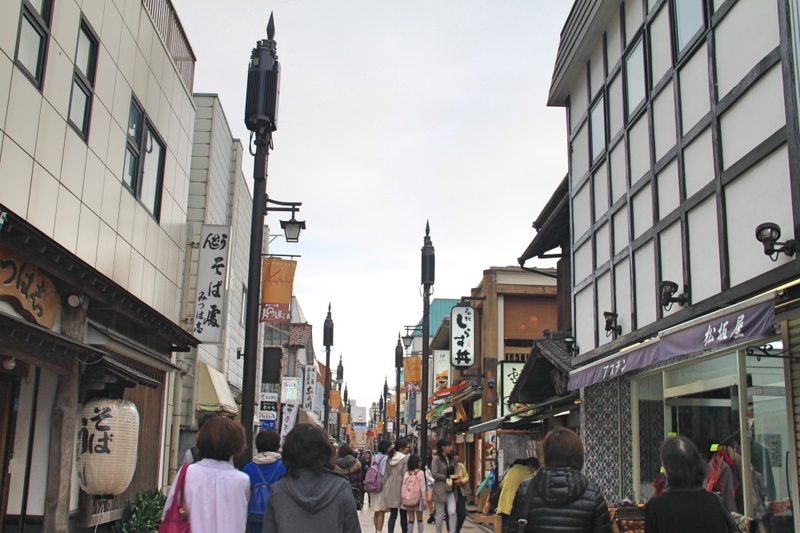 Komachi-dori Street is lined with lots of restaurants, cafes, boutiques, Japanese-style sweet shops and souvenir shops. Kamakura’s main shopping street, Komachi-dori Street. As we walked down the street there were many eagles flying overhead. Some even swooped down to try and grab food from the hands of unsuspecting tourists! But sadly they were way too quick for us to get any decent photos of them. After all that walking we were starving, so we had lunch at a cute little restaurant called Kamakura Horetarou just off the main street. 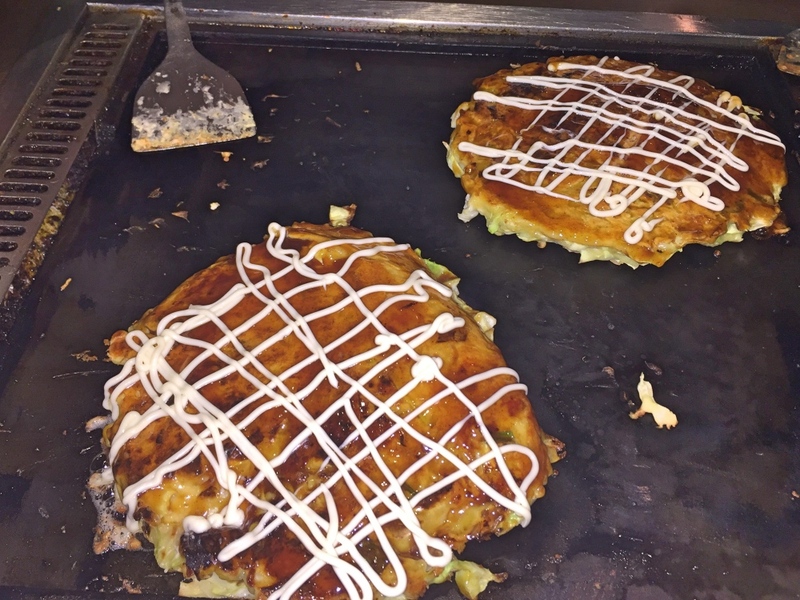 It served Okonomiyaki, the traditional Japanese pancake. What was special about this restaurant? Well, we had to make our own pancakes! We ordered the ingredients and our waiter delivered a bowl of the mixture to our table where we cooked it on a hotplate. It was awesome! We even managed to make them look almost as good as the ones in restaurants and they were delicious! Simon cooking our Okonomiyaki (pre-flipping). Our delicious Okonomiyaki finished and ready to eat! As we were running out of time, our last stop was at the Tsurugaoka Hachiman-gu Shinto Shrine, Kamakura’s most important shrine. 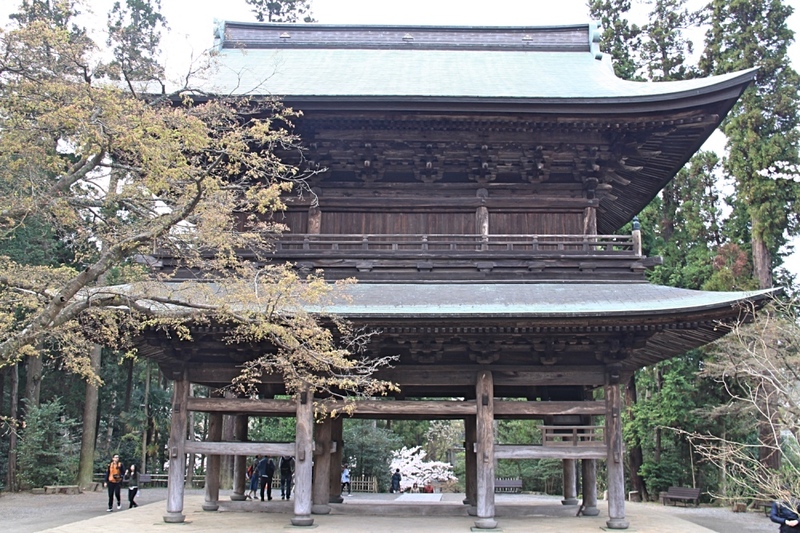 It is an amazing shrine with a long promenade leading up to it. The shrine is surrounded by beautiful gardens, lotus ponds and decorative bridges. We were also lucky to find many cherry blossoms still in bloom there! There are a few steep steps leading up to the main building but you will get a great view of Kamakura from the top. The gardens behind the temple are also worth exploring as they take you to several other smaller shrines. 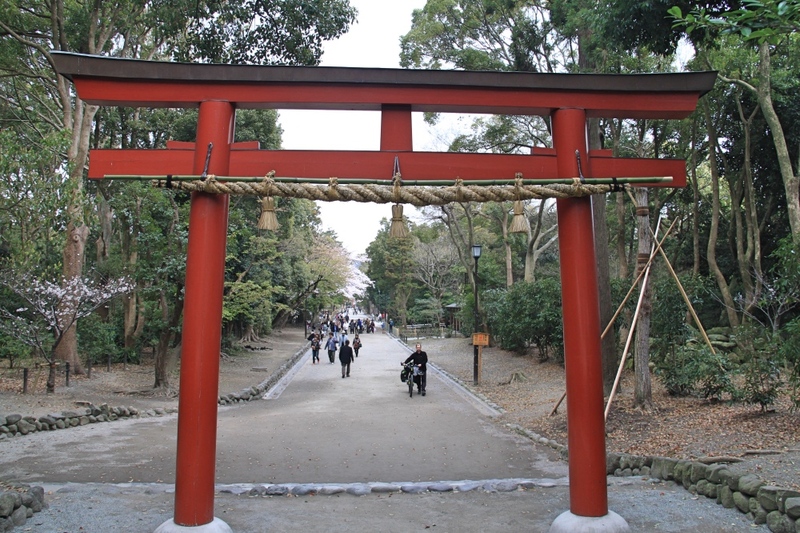 One of the many tori gates leading to Tsurugaoka Hachiman-gu. Inside Tsurugaoka Hachiman-gu’s main temple. The main pond of the Tsurugaoka Hachiman-gu shrine. The park is popular with both locals and tourists alike. 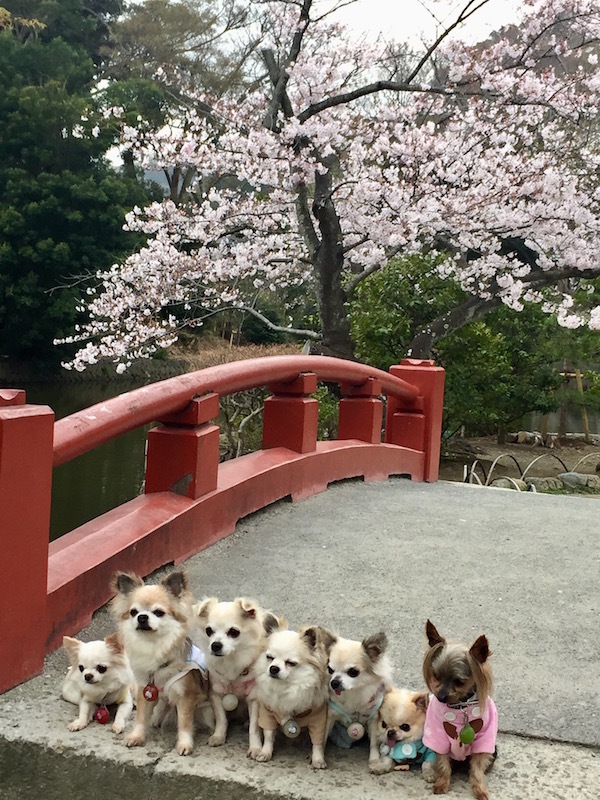 We were highly amused by one Japanese couple who brought along their seven chihuahuas in a pram for a family photoshoot in front of the cherry blossoms. So cute! 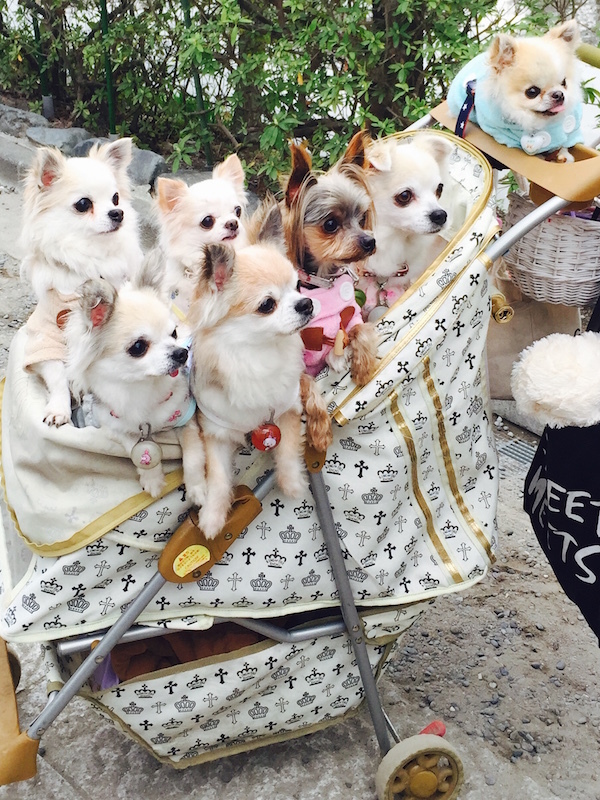 That’s a lot of dogs! A photoshoot under the cherry blossoms! 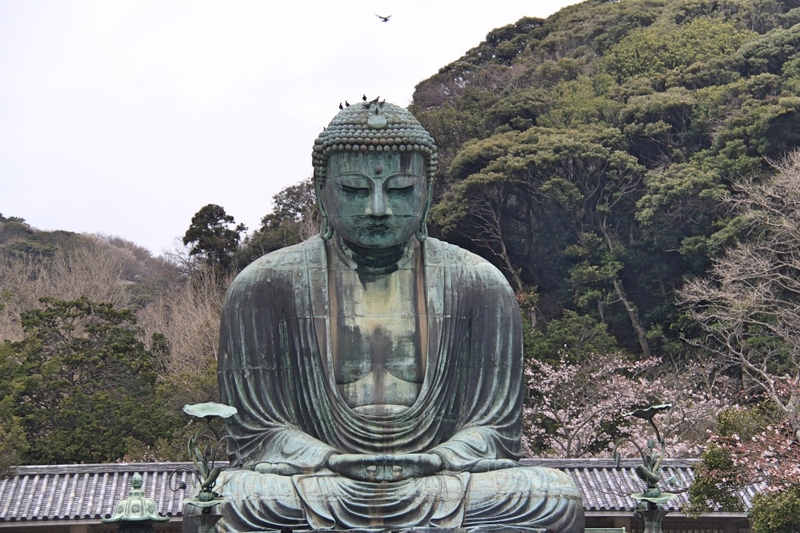 We really enjoyed our day trip to Kamakura; it’s such an easy place to visit from Tokyo. If you want to see lots of Japanese temples but can’t make it to Kyoto then you should definitely head to Kamakura to get your temple fix. Of course, if you can fit in both then that would be even better! It really was. You can always try it next time! 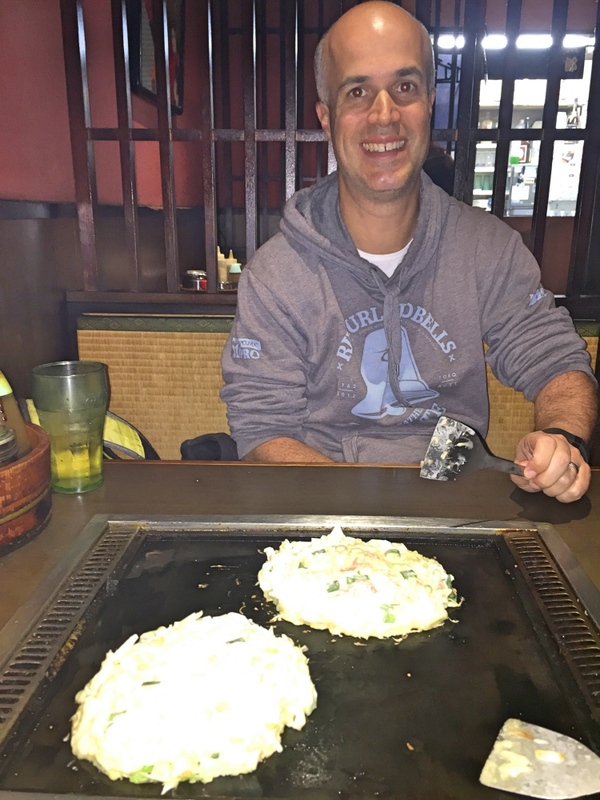 🙂 We love Okonomiyaki so we had a few while in Japan but most of the time they do it for you. Only a few let you do it yourself. Once we were called in by the chef to go in the kitchen being the counter and flip our own pancake! Japan is fun! Tokyo was so crowded when I visited a few years ago. Wish I had known about Kamakura. I love the photo of the Buddha — the patina is amazing and you captured it perfectly!